For Valentine’s day this year I wanted to go all out. I also wanted to cook some new food 🙂 Last year we were just starting the keto diet so V-day was actually the first time we had eaten at a restaurant in 30 days. 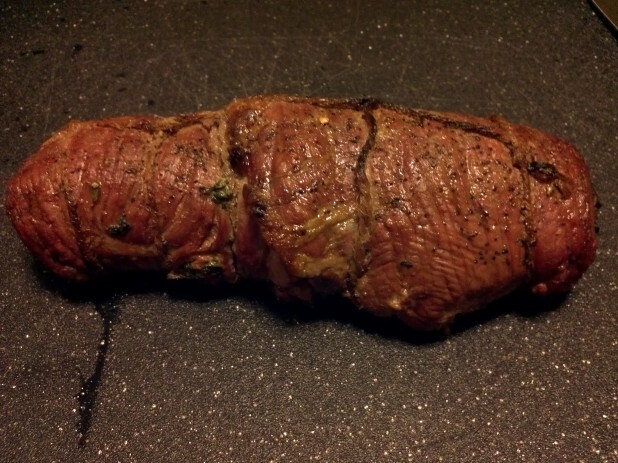 But I digress … For dinner this year we had Seared and Stuffed Flank Steak with a side of Brussel Sprout Burgers and for dessert we had Low Carb Strawberry Cheesecake! 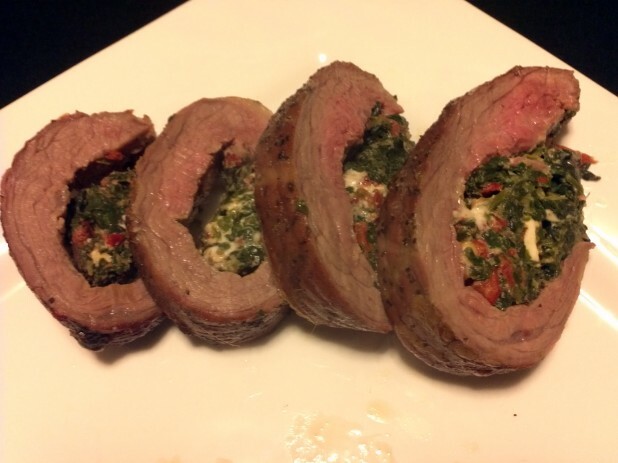 It turned out really well and the meat wasn’t even over cooked! 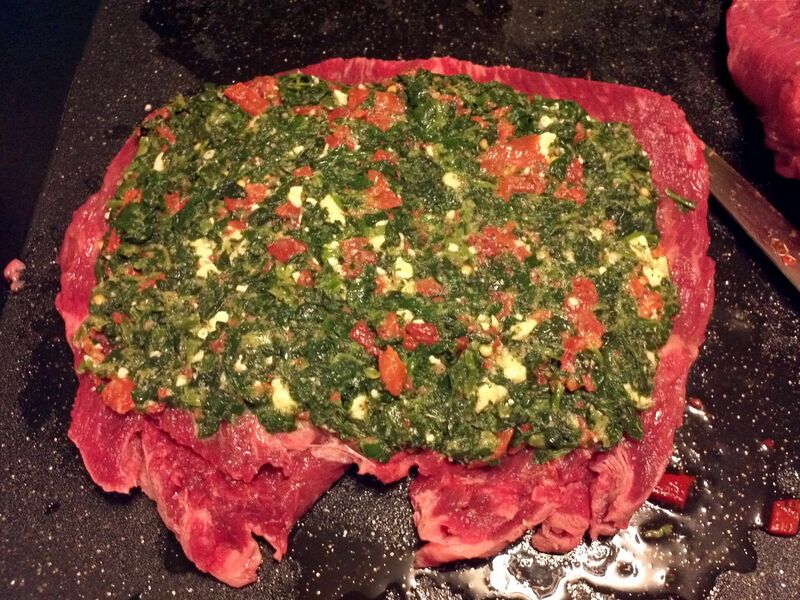 Start with the flank steak. 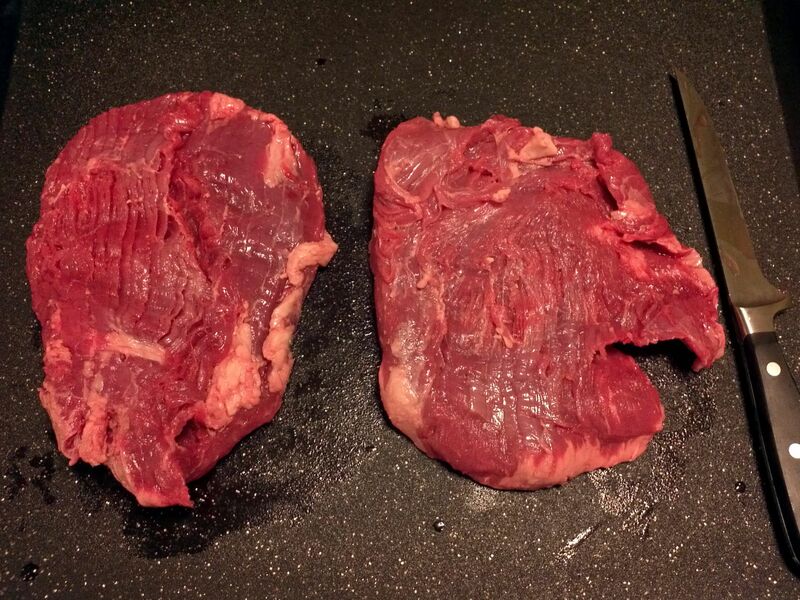 Or in my case, two flank steaks. 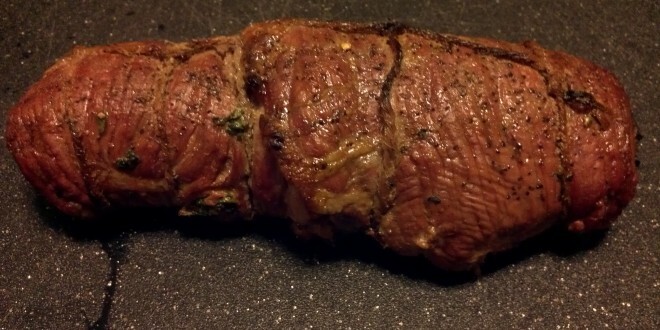 It thought I had gotten one really awesome, mega flank steak but when I got home I discovered it was a package of two. Oh well. The first step is to butterfly the flank steak. To do so, get a really sharp knife and slice parallel to the chopping board, stopping before you cut all the way through. The grain direction is really important for this so make sure it is as I’ve shown above. 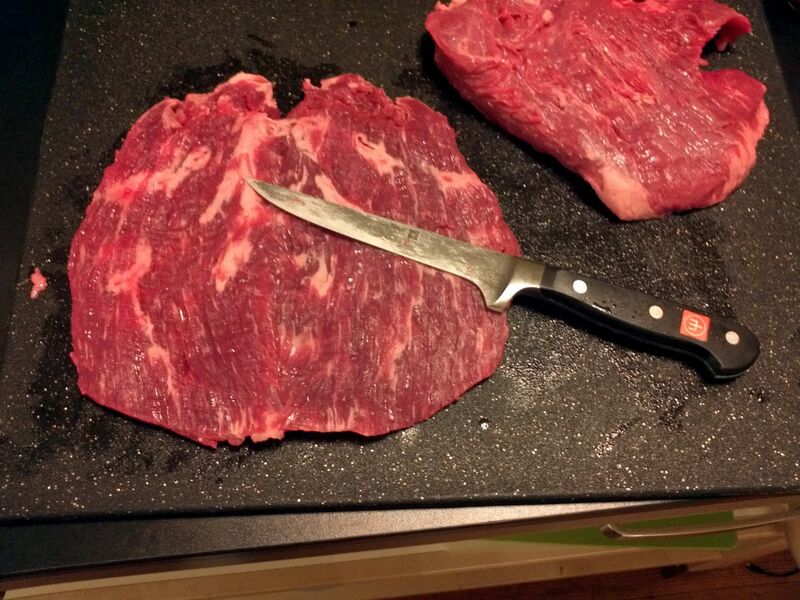 You want to place the meat on the cutting board with the grain going vertically. Then you slice it from right to left and unfold as shown. The grain should still be facing vertically as in the picture. 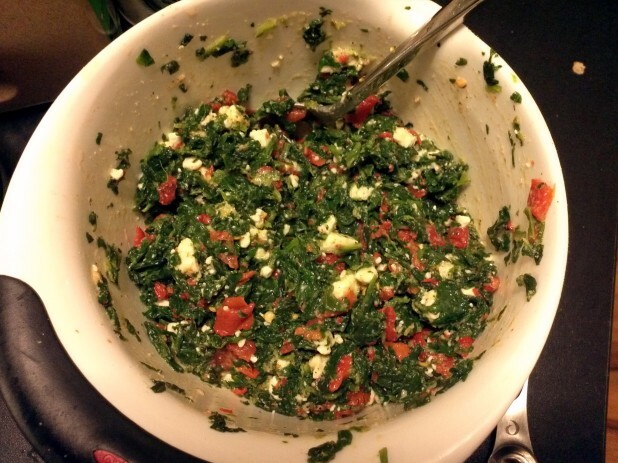 The stuffing starts with spinach. Make sure to drain as much water out of it as you can. 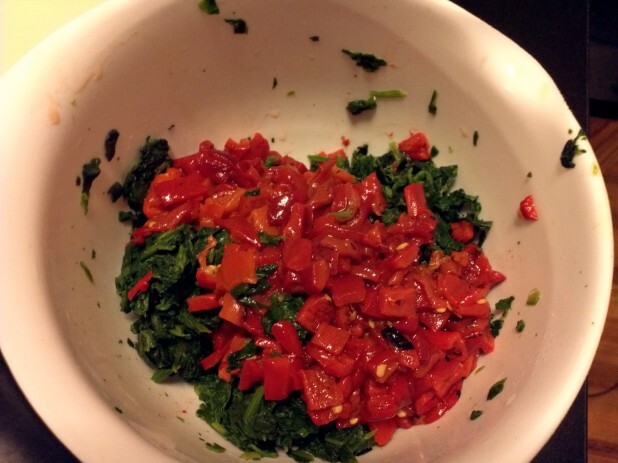 Next chop up some roasted red peppers. These kind of peppers come in a jar and are preroasted. You just have to chop them up. 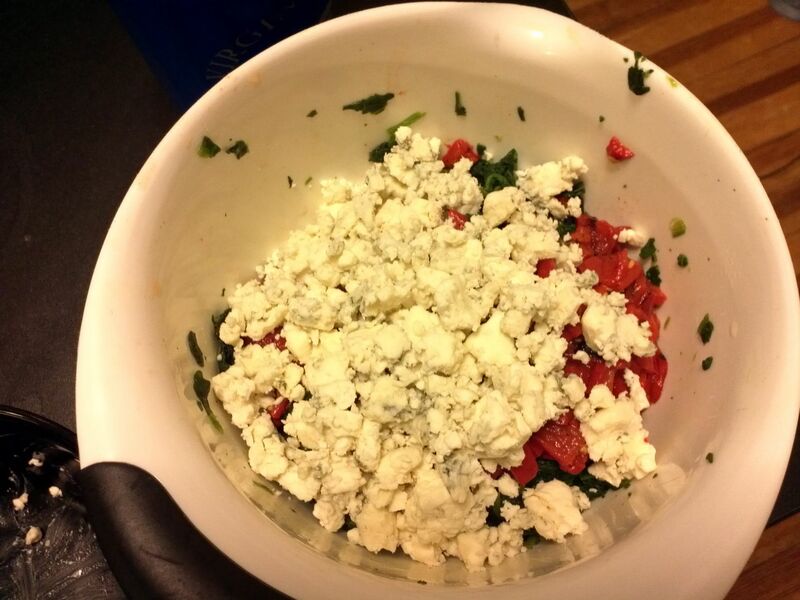 Next comes the crumbled blue cheese. 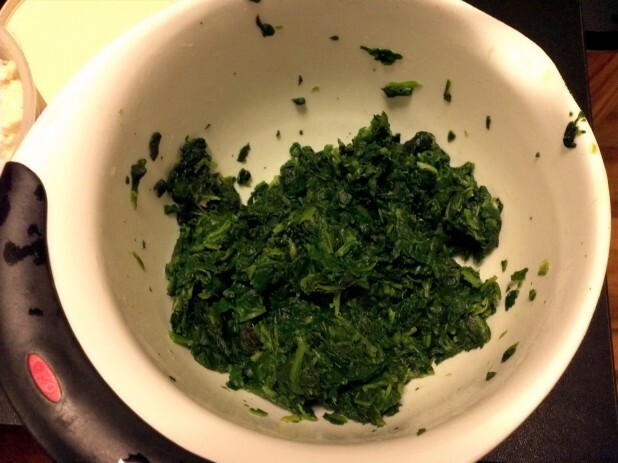 I’m going to skip forward a bit and you’ll just have to trust me that I’ve added the almond flour, an egg yolk, and the seasoning. 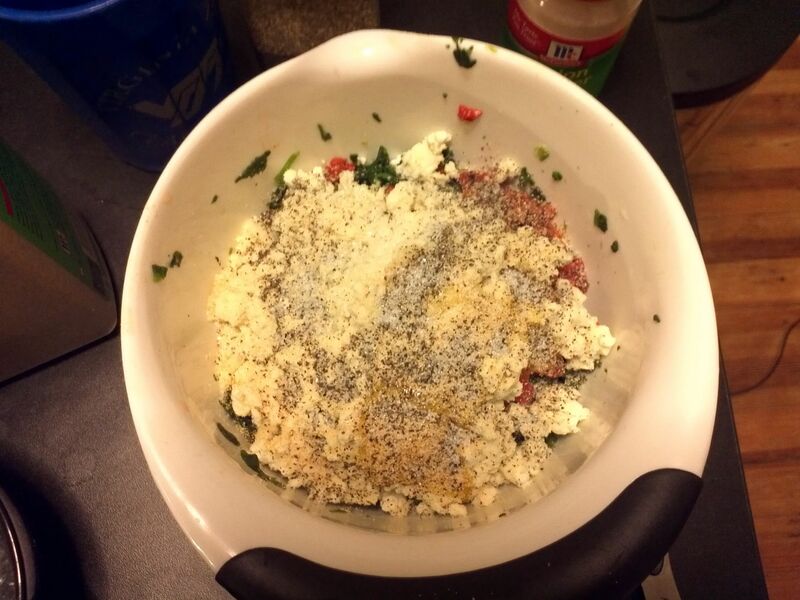 Here is the finished stuffing mixed together! 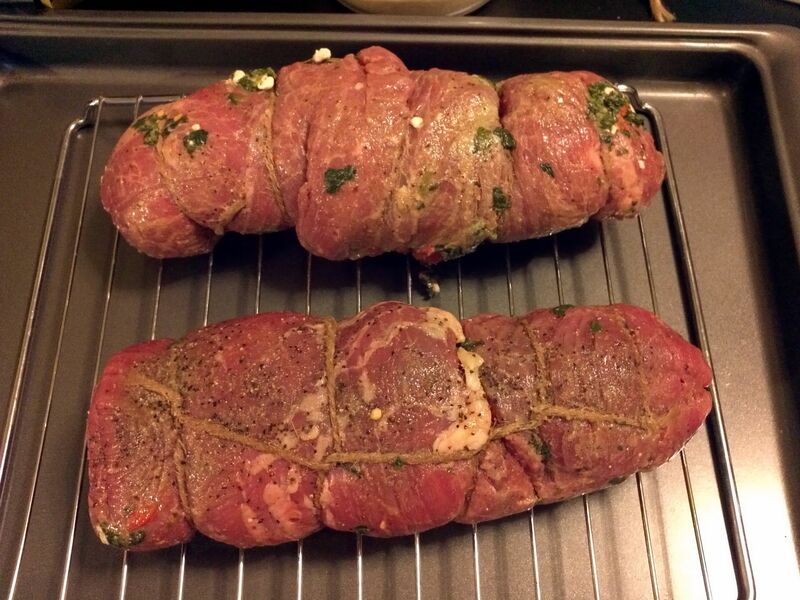 Now lay out the stuffing onto the flank steak as shown. Carefully roll up the steak and it should look like this! Again notice the direction of the grain. It also helps to squeeze it and really try to tighten the wrap after rolling. 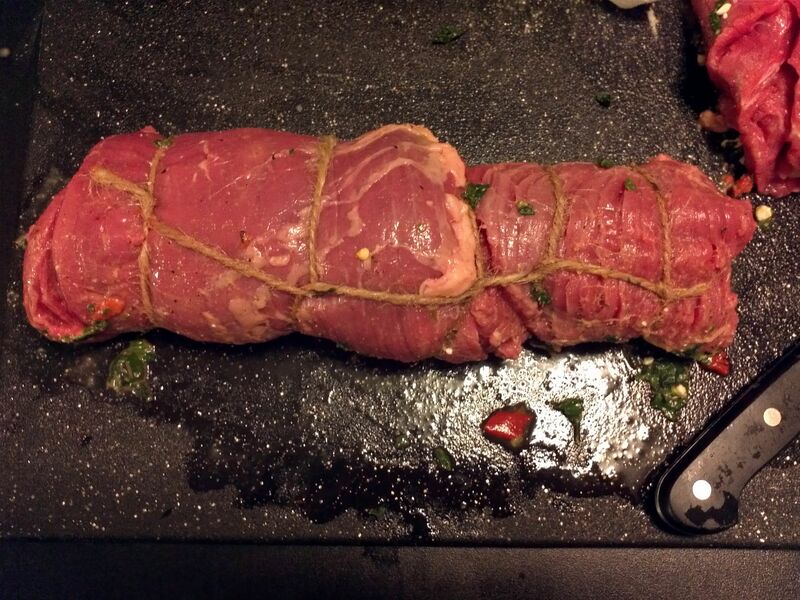 Next, we need to truss the flank steak. 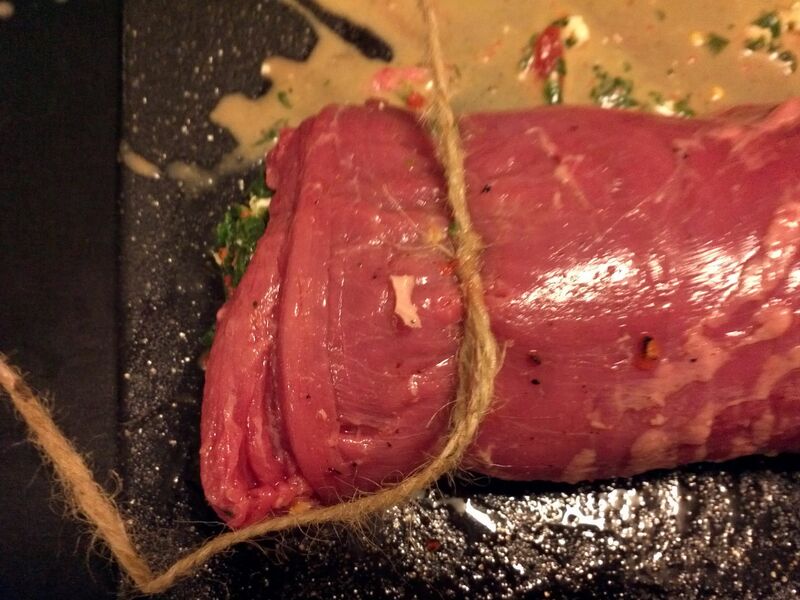 Using cotton cooking twine start by tying an overhand knot at one end of the flank steak. Continue the trussing by doing what’s called a chain hitch over the rest of the roast. Basically you just make a loop for each of the middle elements of the roast. You continue doing this every inch or so until you get to the end. Then at the end you tie another knot. This insures that the meat will stay together and increases the likelihood that the stuffing will stay in. I made these the day before and marinated them over night. 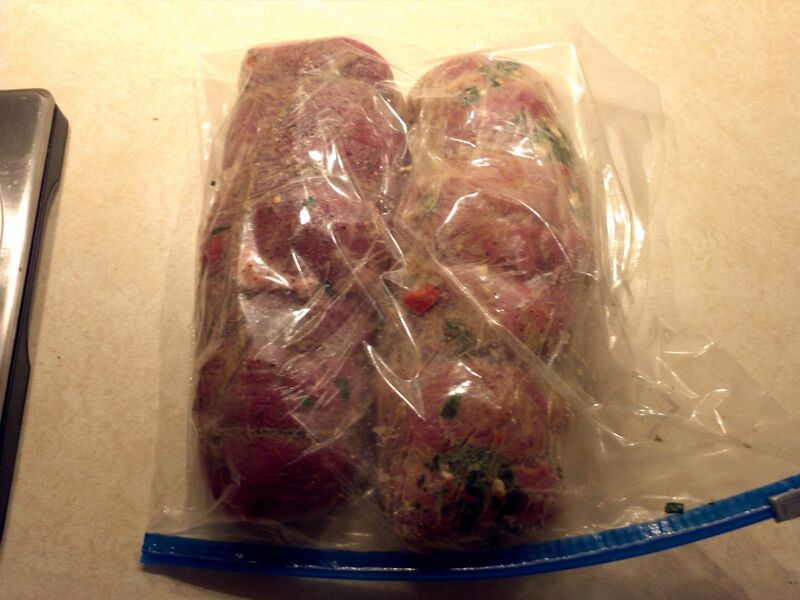 I wrapped them in saran wrap then put them in a plastic ziploc bag. The main reason I did this was to reduce the actual cooking time on V-day. If you’re just making these for dinner you can either cook it right away or maybe marinate for 30 minutes or so. Here are the roasts, ready for the oven! I raised them up via a grate for more even cooking. And there you have it! I turned the steak once during the cooking process as well as broiled it at the end. 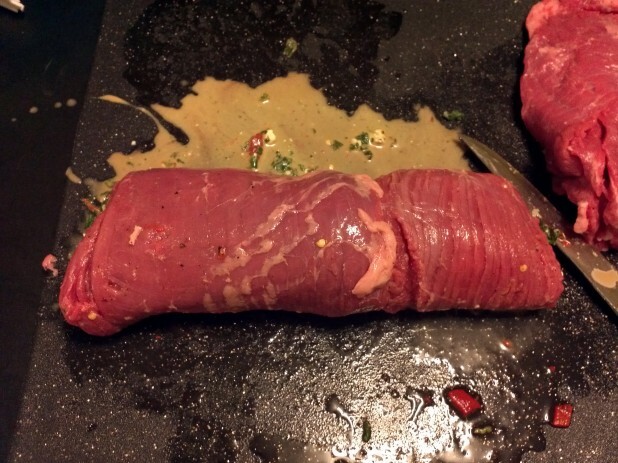 Make sure to let it rest for 5-10 minutes covered in foil for the juices to internalize. 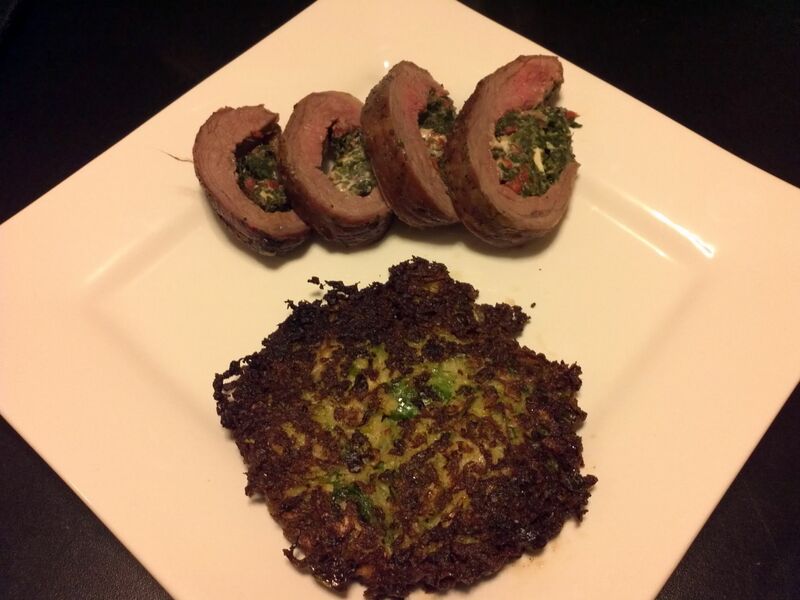 Here’s the Seared and Stuffed Flank Steak along with the Brussel Sprout Burgers. Im just getting into Keto and this looks great. one recommendation that i have read about steaks is to leave them out on an uncovered plate in the fridge over night, and its like a short dry age the helps the flavor. Just a thought, cant wait to try this! What did you marinate these in?